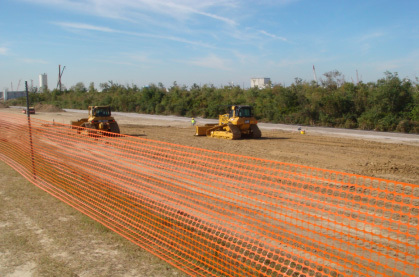 The LPV 111.01 project is a Contractor Early Involvement contract that consisted of 5.3 miles of earthen levee and 1800 LF of concrete T/wall construction. Also, part of this scope is deep soil mixing. This project is the largest deep soil mixing job currently proceeding in the country. Design Engineering, Inc.’s responsibilities included design of 5.3 miles of temporary access roads, 5.3 miles of a HDPE water distribution system and reinforced concrete shallow mat foundations that support two (2) forty-five (45’) foot tall vertical silos. 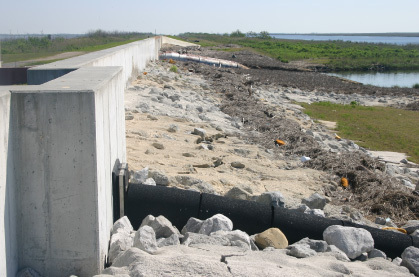 The project also included drainage design that consisted of 12” Corrugated HDPE cross drains every 300 LF through the access road and design of an electrical system to support all required power to the project. Drainage System – Designed cross drain system to ensure project access. The design consisted of a 12” ADS Corrugated HDPC cross drain that was designed to withstand a 220 kop live load from off road equipment d-ring construction. Temporary Access Road – The access road consisted of geogrid material over laid by geomembrane fabric and covered by compacted granular material. Water Distribution System – 5.3 miles of 6” HDPE water main that supplied the entire project with required water supply, which included feeding (12) twelve deep soil mixing rigs. Electrical Distribution System – Designed area lighting along the entire project, power supply for twelve (12) deep soil mixing rigs for 10,000 SF of office trailers. Timber Mat Bridges – Designed timber mat bridge that supported a live load of 270 kips of drainage pipes. Contractor Site Layout – Designed proposed access plan and contractor site layout. 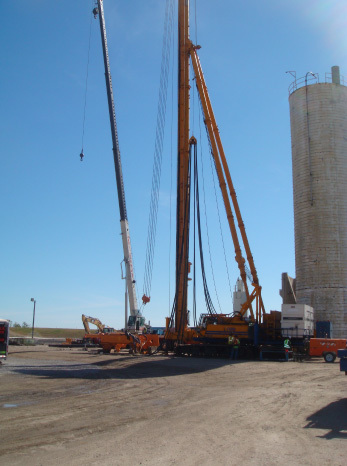 Concrete Silo Foundation – Design of reinforced concrete shallow mat foundations that support two (2) forty-five (45’) foot vertical silos that contained cement for deep soil mixing operations.